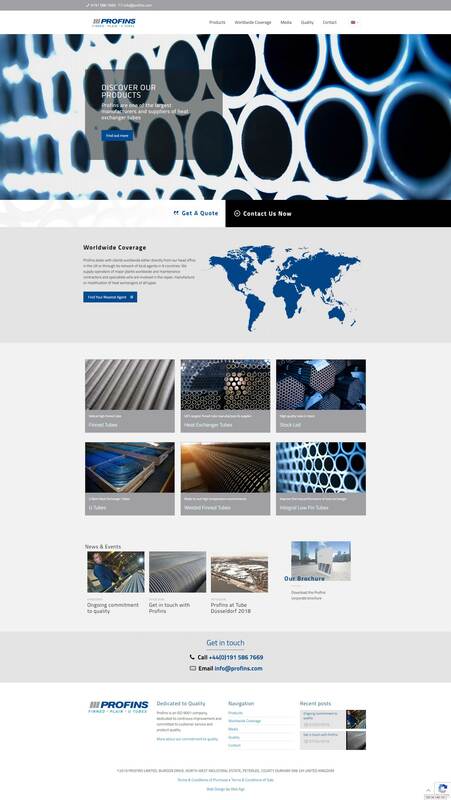 We recently launched a new web design for industrial company Profins, one of the largest manufacturers and suppliers of heat exchanger tubes for applications including the petrochemical industry and other large industrial plants. Web Age have worked with Profins over many years and have collaborated successfully on previous iterations of the website. We have worked on everything from design to animations to translations, specially commissioned for the site. For this latest update of profins.com, we were tasked with creating a new look and feel, using responsive design to improve the user experience of the site, particularly for users on mobile devices. Features of primary importance were to offer content in 3 languages (i.e. English, French and Spanish) and to present complex and detailed specification data in an easy-to-use way that blends attractively with the overall appearance of the site. We also created a bespoke Google map to display international dealer locations, taking the information directly from WordPress pages and making it easy for the site’s owners to edit the map and dealer information without needing any technical knowledge. Finally, we topped off the design with a simple but stylish video background to add interest to the main home page hero banner. The resulting site looks fresh and takes advantage of responsive design to adapt the layout for optimal display on all devices from mobile to desktop. The site should also perform better in search engines as each page has been optimised for the specific language giving customers searching for heat exchanger tubes in French or Spanish a much better chance of finding the site. We also implemented a full redirect scheme to ensure existing pages map to the new equivalents, essential in preserving existing search engine rankings. From design to development to marketing, contact us today to enquire about what we can do for your company.